Last month I blogged about several four-legged mascots who served in World Wars I and II. Some military units around the globe still have them, though nowadays mascots are mainly for show. Consider the United States's own Army mule , or actually mules, as three of them take turns in the spotlight. The United States Military Academy football team at West Point adopted their first mascot mule in 1899 to counter the United State’s Naval Academy’s Bill the Goat. Bill the Goat’s first predecessor, El Cid, former mascot aboard the USS New York, made his debut in 1893 at a game between Army and Navy. Bill XXXIII, a handsome Angora, reigns as the current mascot and is the 33rd Navy goat called Bill. The Marines have a football mascot too: a bulldog called Chesty, named for the most decorated of all Marines, Chesty Puller. However, scores of other mascots have served our Marines over the years, among them cats, monkeys, a duck, and a mixed-breed dog named Sergeant Soochow, who was captured at Corregidor in 1942 and spent three years with his boys in several prisoner-of-war camps, earning Philippine Campaign, Asiatic-Pacific Campaign, Good Conduct, WWII Victory, and American Defense medals and ribbons. Animal mascots are the norm in Great Britain, where they run the gamut from a drum horse named Winston to a ferret maintained by the 1st Battalion the Prince of Wales's Own Regiment of Yorkshire. While they’re nowadays kept for ceremonial purposes only, they once accompanied their units to to the front. Consider William Windsor, a.k.a. Billy, lance corporal in the 1st Battalion, the Royal Welsh, who recently retired with honors after eight years of most exemplary service. His sole indiscretion occurred in 2006 when, in a parade honoring Queen Elizabeth’s 80th birthday, he failed to keep in step and repeatedly tried to headbutt a drummer, acts which resulted in his demotion to fusilier (the equivalent of private) for three whole months. William Windsor. Photograph © Steve Punter. 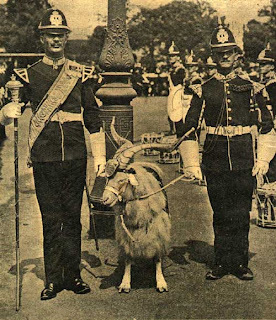 Three Welsh regiments kept white goat mascots until 2006, when they were combined into a single unit (the Royal Welsh) with William Windsor as its head. 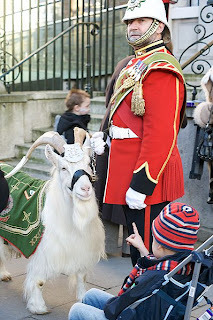 Since the mid-19th century, Welsh regimental goats have been Kashmir goats descending from seedstock presented to Queen Victoria (who loved pashmina cashmere scarves) by the Shah of Iran. Shenkin, also sometimes referred to as Taffy, served as famous mascot of the Royal Regiment of Wales; he was officially listed on the roles as Private Gwylim Jenkins. Like the other Welsh regimental goats. including William Windsor. he had his own full-time handler referred to as the Goat Major. 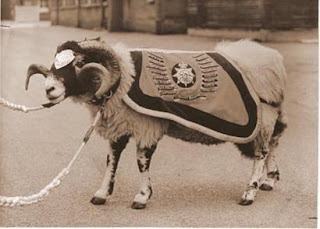 More remarkable, perhaps, considering his predecessor’s background, is Private Derby of the 2nd Battalion Mercian Regiment (Worcesters and Foresters), a handsome Swaledale ram. The first Private Derby was acquired in 1858 by the 95th Derbyshire Regiment of Foot in India, at the siege and capture of Kotah, when the unit’s commanding officer spied a fine fighting ram tethered in a temple yard. He requisitioned the ram, who subsequently marched over 3000 miles with the Regiment; during that time the first Private Derby was undefeated in 33 matches against other fighting rams. At war’s end he was awarded an Indian Campaign Metal, the only British mascot to do so. Later Private Derbys were requisitioned in whatever part of the world the unit was stationed, until 1912, when the Duke of Devonshire began providing rams from his Chatsworth Park flock of champion Swaledales. The tradition continues today. The current Private Derby, who “enlisted” on January 15, 2009, is the 29th ram to bear the name. Like William Windsor, he has his own handlers (the Ram Major and the Ram Orderly) to look after him, and he’s considered a full-fledged member of his unit. His duties are similar as well: He leads the regiment in parades and represents it at other public functions, where he appears in full Private Derby regalia, a scarlet jacket faced with Lincoln green and gold. Sue Weaver sold her first freelance article in 1969. Since then her work has appeared in major horse periodicals, including The Western Horseman, Horse Illustrated, Chronicle of the Horse, Flying Changes, Horseman’s Market, Arabian Horse Times, The Appaloosa News, The Quarter Horse Journal, Horse’N Around, and The Brayer. Sue is based in the southern Ozark Mountains in Arkansas.